The Gators rolled over the Bears to improve to 2-0 on the season in front of 1,572 fans at Katie Seashole Pressly Stadium on Saturday. Sophomore pitcher Stephanie Brombacher notched her first victory of the season after hurling a one-hit shutout. Brombacher struck out eight batters and allowed one walk and one hit batter. The first Baylor hit of the game came with one out in the sixth inning. 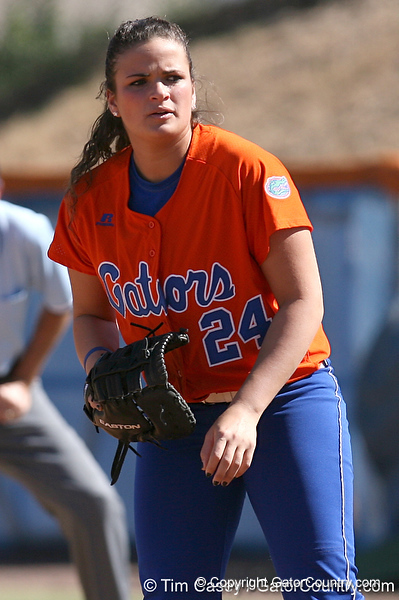 The Gators racked up nine hits and four walks, striking out only twice in the victory. Florida sophomore second baseman Aja Paculba hit her first home run of the season, her first double of the year and stole her second base of the season. Paculba scored two runs and had two RBI, including a walk-off double in the sixth inning to end the game early. Senior centerfielder Kim Waleszonia and junior left fielder Francesca Enea each hit their first home run of the year. Enea's first inning three-run blast gave the Gators all of run support they would need. Sophomore third baseman Corrie Brooks had two hits, including a double and and an RBI. Florida senior first baseman Ali Gardiner checks the pitch sign during the Gators' 8-0 win against the Baylor Bears on Saturday, February 7, 2009 at Katie Seashole Pressly Softball Stadium in Gainesville, Fla.